So, I think I'm relaxing way too much. I came back from my trip with the decision to blog as much as possible, and honestly, it hasn't happened. It's not because I don't want to. I think it's just because of summertime laziness. Seeing the sun outside, as well as the rain (which I honestly love more than the sun), really makes me want to be outside hanging out with friends and having some crazy fun adventures. Like yesterday. I was really nervous and anxious, and I knew I had to relax in one way or another that had nothing to do with being home. I called my good friend Frances, and said, "Let's go to the beach." Before we knew it, we collected all the necessary goodies for a fun beach day, and off we went to South Beach. No lie, it was a "pretty people" day. I did not spot ONE ugly person in the whole area surrounding us. It was incredible! We relaxed, people watched, got some sun, then eventually drove back to the real Miami, back to reality. Days like those make me completely forget about the Internet, chores, job-related stuff, and just everything that has to do with responsibility. "SHAPING THE LOAF: To shape dough for a loaf pan, place on a floured board and pat into a long, even rectangle. Lift one short side and fold it over to cover about two-thirds of the rectangle. Now lift the other short side and fold it to overlap the first side, much like folding a letter. Flatten the dough with your hands, then, beginning at a short end, tightly roll up the dough like a jelly roll. Using your palms, roll the dough log back and forth on the board until it is the length of the pan. Pinch together the long center seam and the spiral seams on both ends to neatly seal the loaf." 1) In a bowl, sprinkle the yeast and brown sugar over the water and stir to dissolve. Let stand until foamy, about 10 minutes. 2) In a heavy-duty mixer fitted with the paddle attachment, combine the buttermilk, maple syrup, oil, salt, and 2 cups of the whole-wheat flour. Beat on medium-low speed until creamy, about 1 minute. 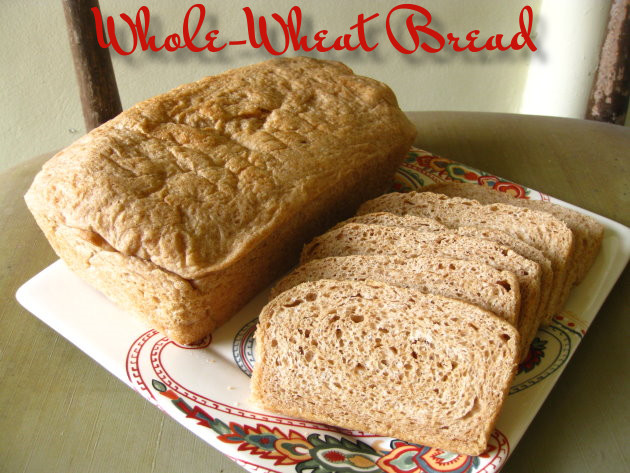 Beat in the yeast mixture and the remaining whole-wheat flour and beat for 1 minute. Beat in the bread flour, 1/2 cup at a time, until the dough pulls away from the bowl sides. Switch to the dough hook. Knead on low speed, adding bread flour 1 tablespoon at a time if the dough sticks, until smooth but slightly sticky when pressed, about 5 minutes. 3) Transfer the dough to an oiled deep bowl and turn the dough once to coat it. Cover loosely with plastic wrap and let rise at room temperature until doubled in bulk, 1-1 1/2 hours. 5) Preheat the oven to 350F. Bake until the loaves are golden brown and pull away from the pan sides, 35-40 minutes. Turn out onto racks and let cool completely. Hey Velez Delights! I nominated your wonderful blog for the Kreativ Blogger Award! You did??? Thanks so much!! !